Steve McDonald, who spent 28 years at Palomar as a professor and dean, is set to publish a new collection of poems in 2018. 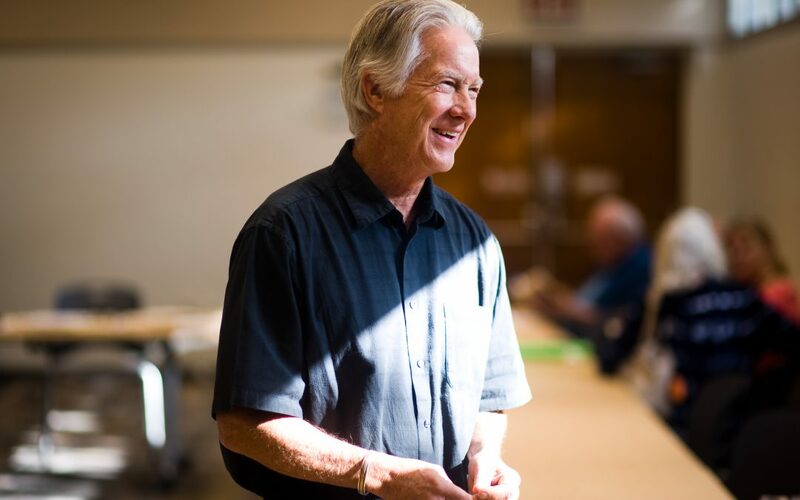 CARLSBAD — At the head of the Carlsbad Library’s community room on a recent afternoon, Steve McDonald smiled at each of the 22 people who had shown up for his poetry workshop as they explained what compelled them to write. Mostly retirement-age, the attendees would spend the next two hours sharing their stories, murmuring their admiration as McDonald read from his favorite poems, and testing out some lines of their own. It was the sort of thing McDonald did for more than 30 years as a college educator who spent the majority of his career at Palomar College. Hired in 1984, McDonald taught English at Palomar for 23 years, followed by five years as Dean of Languages and Literature. During his tenure at Palomar, he also co-authored several textbooks with fellow English Professor Bill Salomone. Having lived in Murrieta since 1989, McDonald now divides his time between writing, family life, poetry workshops, and working with twelve-step programs, which he has been doing for 32 years. Originally from San Marino, McDonald attended grad school at San Diego State University (SDSU) and the University of California, Riverside (UCR) before teaching English at Mesa, Southwestern and Grossmont community colleges. As his daughters grew, McDonald had more time for writing, and he decided to take up poetry again after Salomone introduced him to the work of former U.S. Poet Laureate Billy Collins. “I really liked what he was doing. I also thought, ‘I could do that. I could write that.’ Of course, I’d been teaching and reading poetry all my life, but I hadn’t read a lot of contemporary poetry. So I started reading it,” said McDonald. McDonald’s first book of poetry, “House of Mirrors,” was published in 2013, followed by an award-winning chapbook, “Golden Fish / Dark Pond” in 2014. His latest collection, “Credo,” is due out next year. Now that he is retired, with one grandchild on his knee, McDonald has devoted more time to poetry, with recent credits in a variety of literary journals across the country. “It’s one of those things that it seems like you’re stumbling into it,” he said. “And then you go, ‘Oh, this is where I belong. I fit here.’ It was that kind of life experience that occurred. Then it was a challenge, because I really liked this life in poetry, but I also had my marriage, and I’m a father, I write textbooks, and I’m teaching. So how do I fit it in? McDonald recalled a couple of the poems that he wrote during his years at Palomar with fondness: “I have one that I wrote where a student walked in and had been sort of struggling the whole class and not doing any of the work and even plagiarized a paper, then came in and asked, ‘If I ace the final, will I pass the class?’ And the answer was no. He quoted Robert Frost, who said, “No surprise for the writer, no surprise for the reader,” and stressed the importance of imagery in a good poem.